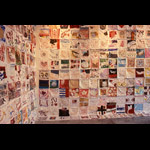 In this two-year project Pam Hall and Margaret Dragu - living on opposite ends of the country in Newfoundland and British Columbia - draw, paint and sew an ongoing series of fabric panels that they send to one another using the postal system. 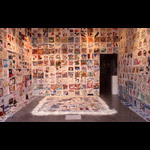 Referencing mail art, feminine craft, and epistolary traditions, the project is an expanded investigation into the nature of communication. She makes visual art, constructs installations, works with language, and is engaged in film, video, and most recently, performance. She works alone (inside and outside of her studios), and collaborates with others (sometimes individuals, sometimes communities). Based in St. John's, Newfoundland, Canada, she travels extensively to pursue the creation and presentation of her work, and to teach graduate students in the U.S. Her work has been shown throughout Canada and internationally. Margaret Dragu is celebrating her fourth decade as a performance artist. She has presented her work in galleries, museums, theatres, nightclubs, libraries, universities and site-specific venues including parks, botanical gardens, and public parade routes across Canada, the west and east coast of the United States, and in Western Europe. Margaret is also a film/video artist, writer, choreographer, fitness instructor/personal trainer, and an extremely famous cleaning lady.